The approval of a targeted therapy and an immunotherapy drug for some patients with advanced stomach cancer reflects recent new approaches to this difficult-to-treat cancer that hasn’t had many therapeutic advances in recent years. Stomach cancer, uncommon in the United States but a leading cause of cancer death globally, causes few definitive symptoms in early stages and is usually diagnosed too late for curative therapy. The main treatment for stomach cancer is surgery to remove the tumor, combined with chemotherapy, which can be given before or after surgery. Radiation therapy may also be used in combination with surgery or chemotherapy. Unlike many other types of cancer, stomach cancer research has seen few developments leading to precision therapies that can home in on molecular weak points to halt or shrink tumors. One such therapy, approved in 2010, targets a protein, HER2, that is over-expressed on the surface of about 20 to 25 percent of stomach cancers. The drug trastuzumab (Herceptin) was approved for use with chemotherapy in patients with HER2-overexpressing metastatic cancer of the stomach or gastroesophageal junction – the area where the stomach and esophagus meet. Other drugs that target HER2, such as lapatinib (Tykerb), pertuzumab (Perjeta), and trastuzumab emtansine (Kadcyla), are now being studied in clinical trials. Immunotherapy drugs, which help the patient’s immune system seek out and destroy tumor cells, have proven very effective for some patients with advanced melanoma, non-small cell lung cancer, kidney cancer, and other cancer types. In September 2017, the U.S. Food and Drug Administration (FDA) approved pembrolizumab (Keytruda) for people with certain advanced cancers of the stomach or the gastroesophageal junction. The approval applies to patients with advanced cancers, called adenocarcinomas, that have come back or continued to grow after having at least two previous treatments. The cancer cells must also test positive for the PD-L1 protein, which allows some cells to escape attack by the immune system. The FDA also approved a new lab test to check these cancers for the PD-L1 protein and determine whether the patient is likely to benefit from cancer drugs known as immune checkpoint inhibitors. Pembrolizumab has also been approved to treat any type of tumor that is so-called MSI-High, meaning its cells exhibit microsatellite instability. A small percentage of stomach cancers have this characteristic. In an effort to diagnose stomach cancer earlier, researchers are looking at known risk factors, such as mutations that run in certain families that increase the risk of the disease, although these are rare. The strongest known risk factor for stomach cancer is infection with the H. pylori bacterium, which is found in about 50 percent of the world’s population. H. pylori infection causes chronic inflammation and increases the risk of developing ulcers and stomach cancer. However, most people whose stomachs harbor the bug don’t develop cancer. Studies are being conducted to see whether antibiotic treatment of people who are chronically infected by H pylori will help prevent stomach cancer. Some studies have found that treating this infection may prevent precancerous stomach abnormalities, but more research is needed. Another research effort, which has led to the identification of four subtypes of stomach cancers, highlights the complexity of the disease, and may eventually lead to more precise treatments. 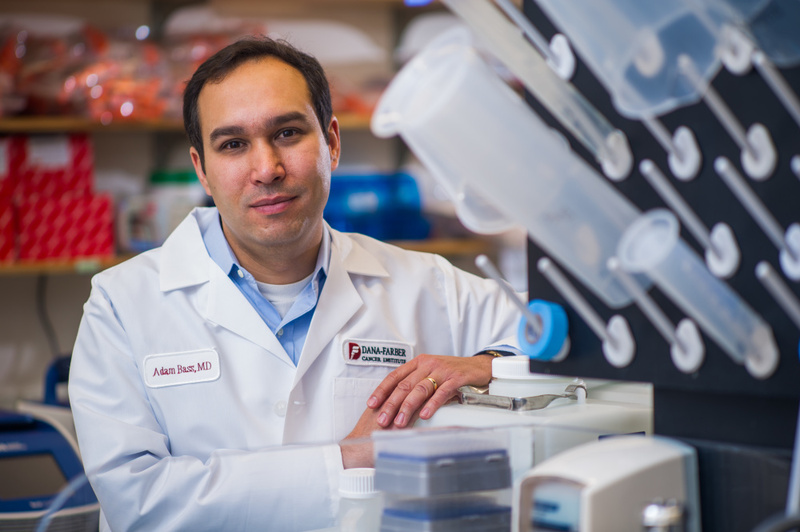 Investigators led by Adam Bass, MD, reported that analysis of 295 samples of stomach cancers revealed four groups that had distinct features and types of molecular alterations. Bass, who directs the Center for Esophageal and Gastric Cancer at Dana-Farber, says that grouping the cancers this way will help researchers enroll patients in clinical trials that test drugs aimed at targeting their specific stomach cancer subtype. Chris Sander, PhD, director of the cBio Center at Dana-Farber. Sander is co-founder of the computational biology field and a leader in applying its methods to cancer research. Scattered amongst the letters of genetic code in a tumor cell are telltale mutations and DNA alterations that spur its malignant activity. But there are billions of letters of code and each patient’s cancer is different, with its own particular genetic changes. These changes may dictate how it behaves, how aggressively the cancer progresses, and it may spell out which molecular weaknesses might be successfully attacked with treatments. 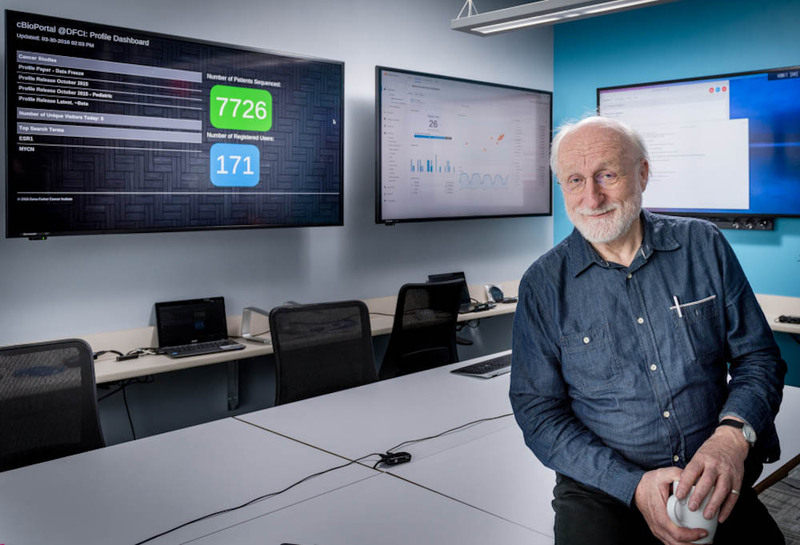 Technology like the OncoPanel platform of Dana-Farber’s Profile research program can rapidly decipher the DNA code of 400 cancer-related genes in an individual’s tumors, detecting mutations, missing or extra copies of genes, and other changes. But it’s a process that generates massive volumes of digital data – data which mean nothing until processed and analyzed. Only then, may researchers and oncologists be able to prescribe a precision treatment to target the specific mutation. This is the goal of precision cancer medicine, but it’s often a needle in a haystack search. The cBio Portal software digests the data and presents it in diverse visual formats that help investigators detect patterns of abnormalities across groups of patients and cancer types. With cBioPortal, a researcher can tap into the Profile tumor base of nearly 8,000 genomic tumor profiles and rapidly compare the mutation pattern in one patient’s tumor to those of hundreds of other patients. Some cancers with certain mutations might have an approved drug targeting those changes; finding the same mutations in other tumor types may lead to new trials of that drug. “We will be able to use cancer genomics to define groups of patients who might be eligible for new kinds of genomically informed clinical trials,” says Sander. The cBioPortal analysis tools can also help scientists sift genomic data for clues to why a few patients in a clinical trial had dramatic responses to a drug that had little benefit for the majority of other patients. The cause of this “exceptional response” may be a previously undiscovered mutation that made the tumor vulnerable to the drug – and cBioPortal analysis of genomic profile data may help scientists discover it. The scientists are now working on tools to enable oncologists and patients to sit down together and use MatchMiner to search for clinical trials of drugs targeted to their cancer’s specific mutation pattern. Six Things to Do When You Learn You Have Cancer. Slow down and give yourself a chance to cope. Set aside time for yourself and your loved ones. It’s easy to feel isolated when you put up a strong front, so keep the lines of communication open with your family, friends, and doctors. Try to gain strength from one another by expressing your emotions honestly and openly. Learn what services and programs are available. Many patients don’t take full advantage of support and resources simply because they haven’t had a chance to learn what’s out there. The National Cancer Institute offers advice for finding support resources in the general community. At Dana-Farber, patients and their loved ones can leaf through their patient handbook or talk with a concierge in the Shapiro Center for Patients and Families to learn about available programs (they can also call a concierge at 617-632-3750). Accept help from others. Make a list of ways that friends and family can help, and suggest specific tasks. Friends or family members who assist with the day-to-day challenges of living with cancer can review the helpful advice and tips in Dana-Farber’s downloadable caregiver booklets. Beth Overmoyer with patientLearn more about your cancer. Gather basic information about your diagnosis, to the extent that you feel comfortable. Take notes when your doctor or nurse explains something, or ask a loved one to do so. If you have questions before an appointment, write them down and ask them when you meet with your cancer care team. At Dana-Farber, you can research more about a cancer diagnosis with help from a trained volunteer or staff member in the Eleanor and Maxwell Blum Patient and Family Resource Center. Step back and think about how you are coping. Everyone reacts to a cancer diagnosis in his or her own way, so it may help to turn to strategies that have helped you manage and reduce stress in the past. Ideas to consider: Practice relaxation techniques or attend a yoga class (both available through Dana-Farber’s Zakim Center). Rely on your preferred spiritual support. Start (or continue) an exercise routine. At most cancer centers, you can let your doctor or nurse know if you are feeling particularly stressed and they can help you make an appointment with one of our social workers. Connect with others in your situation. Talking with someone who has previously dealt with cancer can be a great help. Dana-Farber’s One-to-One program links trained volunteer cancer survivors with those who are facing it for the first time. Similarly, CancerConnect offers an online forum where patients and family members can connect with cancer patients, doctors, survivors, family members, and friends for advice, support, and guidance. Scientists find mutation driving pediatric brain tumors. The researchers led a study of pediatric low-grade gliomas, samples of which were collected through an international consortium organized by brain tumor specialists at Dana-Farber/Children’s Hospital Cancer Center. Their findings are being published online by the Proceedings of the National Academy of Sciences (PNAS) the week of April 29. The investigators focused on diffuse low-grade gliomas, so-called because they lack a tumor mass but spread throughout the brain. As a result, diffuse gliomas often recur after surgery and are more likely to evolve into lethal glioblastomas than are non-diffuse low-grade tumors. “Many of these patients do well, but it’s hard to generalize, as the tumors are difficult to diagnose and study because without better tools pathologists can’t name them consistently,” explained Ligon, who in addition to being a researcher is also a neuropathologist. The research was undertaken in hopes of identifying a common genetic alteration that could be used to better define and design treatments for them. One alteration stood out: a gene called MYBL1, a transcription factor important for controlling other genes, was rearranged and missing a part of its genetic message in nearly 30 percent of the diffuse tumors categorized as grade 2 in terms of aggressiveness. The scientists went on to show that the mutated version of MYBL1 can cause tumors in mice. Previously MYBL1 was not known to cause cancer, but a closely related gene, MYB, is one of the oldest “proto-oncogenes” — a normal gene that can become a cancer-causing gene. The paper’s other authors include investigators and clinicians from Dana-Farber; the Broad Institute; Brigham and Women’s Hospital; Boston Children’s Hospital; Stanford University School of Medicine; Children’s Cancer Hospital, Cairo, Egypt; University of Texas South Western Medical Center, Dallas; Hospital for Sick Children, Toronto; Children’s National Medical Center, Washington; Johns Hopkins University School of Medicine; and the University of Calgary. Targeting cancers’ ‘addiction’ to cell-cycle proteins shuts down tumors in mice. In what they say is a promising and highly selective treatment strategy, scientists at Dana-Farber Cancer Institute have safely shut down breast cancer and a form of leukemia in mice by targeting abnormal proteins to which the cancers are “addicted,” according to a new study. Even though the investigators genetically silenced the proteins or blocked them with a drug in normal as well as cancerous tissues, the animals remained healthy, they report in the Oct. 16 issue of the journal Cancer Cell. The experiments targeted two related proteins, cyclin D1 and cyclin D3, that control cells’ growth cycle. Many types of cancer have abnormal amounts of the proteins, spurring the cells to grow too rapidly and form tumors. Peter Sicinski, MD, PhD, the paper’s senior author, said that the new results show that the cancers’ addiction to these proteins is an Achilles’ heel that can be safely targeted with an inhibitor drug that halts cancer growth or causes cancer cells to die. Based on the results, the Dana-Farber scientists are planning a clinical trial, using an experimental cyclin-inhibiting drug called PD0332991 that has already been tested in a form of lymphoma. “It was impressive to find that you could target a single cyclin protein and completely clear the leukemia and the mouse remained healthy,” said Yoon Jong Choi, PhD, the study’s lead author. “We’re excited because we think this approach is very promising” as a potential treatment for some cancer types, she added. Some of the experimental mice had been engineered to develop a type of breast cancer driven by the ErbB2 oncogene. Others were modified to develop a type of T-cell acute lymphoblastic leukemia (T-ALL) that is driven by an abnormal pathway known as Notch1. In one experiment, human T-ALL cells were infused into mice that then developed the disease. Blocking cyclin D1 in the mice drove the breast cancer cells into a kind of permanent retirement called senescence, an irreversible halt to their growth cycle. Inhibiting cyclin D3 in the T-ALL leukemia mice caused the cancer cells to self-destruct — a programmed death process called apoptosis. In addition to these tests with mouse cancers, the scientists found that the cyclin-D-inhibiting drug had similar effects on human blood cancer cells in the laboratory. Cyclin proteins act as “checkpoint” guards to control cell’s cycle of rest, growth and division. The D-cyclins determine when a cell begins making DNA in preparation for dividing to form new cells. In many types of cancer, an excess of cyclins allows cells to grow too fast and form tumors. Abnormal cyclins D1, D2 and D3 are found in breast, lung, endometrial, pancreatic, and testicular cancers and in multiple myeloma and other blood cancers. In a key report in Nature in 2001, Sicinski showed that mice engineered to lack cyclin D1 were resistant to developing breast cancer. It wasn’t known for many years, however, whether knocking out cyclin D1 could halt an established cancer, or if breast cancer needed the protein long-term. Also unknown was whether normal cells could get along without cyclin D1: If not, treating cancer by targeting the protein might be too dangerous. To test these questions, Choi and her Dana-Farber colleagues developed a strain of mice with cyclin D proteins that could be inactivated at any time by treating the mice with the drug tamoxifen. “By generating these ‘conditional’ knockout mice, we could address these questions for the first time,” said Choi. The effect was global, affecting all the body cells, not just those that were cancerous. When the cyclin D proteins were turned off using this technique, the addicted cancer cells shut down while normal cells were unaffected. Other authors of the report include Xiaoyu Li, MD, PhD, a co-first author, and Harald von Boehmer, MD, PhD, of Dana-Farber, and Andrew L. Kung, MD, PhD, formerly at Dana-Farber and now at Columbia University. Dana-Farber compounds or creates medication tailored for individual patients. News of unclean facilities and lax safety standards at the New England Compounding Center in Framingham has cast a public spotlight on compounding — a critical, but not widely known, sector of the pharmaceutical industry. To learn more about compounding, its role in cancer treatment, and its use at Dana-Farber, DFCI Online spoke recently with Sylvia Bartel, RPh, MHP, the Institute’s vice president of Pharmacy Services. It’s the preparation of sterile products used to treat patients intravenously. Such medications could be chemotherapy agents, antiemetics (which prevent nausea and vomiting), support medications, or vaccines. Does Dana-Farber’s pharmacy do compounding? Yes. The dose of chemotherapy a patient receives is based on his or her height, weight, and individual health circumstances. Because those factors vary from patient to patient and visit to visit, we prepare patient-specific doses on-site. What are the main types of medications compounded here? In general, they’re chemotherapy agents and biotherapies (drugs that stimulate the body’s immune system defenses) that treat a patient’s cancer. We also prepare antiemetics, as well as intravenous fluid solutions that could contain potassium or magnesium to prevent the depletion of these nutrients in patients receiving chemotherapy. Does Dana-Farber use products from the New England Compounding Center? The only products we’ve purchased from the New England Compounding Center are two topical solutions (agents applied to tissue) used in gynecologic procedures. What is done to ensure the safety of products compounded here? We have numerous safeguards to ensure the proper preparation of sterile products. We train and monitor our staff in correct preparation techniques. We routinely test staff members’ sterile technique and the work environment for microbial growth. We’ve implemented a series of quality-control checks and report regularly to the Institute’s Infection Control Committee. What specific safety precautions are in place? We follow USP 797, a set of regulations developed by the United States Pharmacopeial Convention, a scientific organization that sets standards for the purity of medicines. The standards govern the preparation of sterile products in “clean rooms” where dust and foreign matter is kept below certain levels. Products are prepared within biological safety cabinets within the clean rooms. Before entering a clean room, the staff washes their hands and put on special clothing, much like that used in an operating room. Clean rooms undergo specific cleaning procedures on a daily, weekly, and monthly basis, and we routinely test surfaces from to ensure there is no microbial growth. New research led by Dana-Farber Cancer Institute scientists may soon enable doctors to determine which patients with high-grade serous ovarian cancer (HGSOC) – the most common cancer of the ovary – are most likely to benefit from a certain class of drugs. Using technology able to pick out abnormalities in single units of the genetic code, the researchers sorted tumor samples from HGSOC patients into three subtypes based on the extent of a particular kind of genetic damage within the cells. Patients in the subtype with the highest levels of damage – representing one-third to one-half of all HGSOC patients – were the slowest to develop resistance to platinum chemotherapy treatment such as carboplatin. Overall, these patients lived longer without having their disease worsen than more did patients in the two other groups. J. Dirk Iglehart, MD, of Dana-Farber and Brigham and Women’s Hospital, is the paper’s other senior author, and Zhigang Wang, MD, PhD, of Dana-Farber, is the first author. HGSOC cells have a high degree of “genomic instability,” their nuclei littered with large numbers of extra or missing chromosomes or chromosome fragments. One of the consequences of this havoc is a process known as loss of heterozygosity (LOH). LOH occurs in cells that lack the usual complement of two normal copies of each gene, having instead a normal and mutant copy of certain genes. When the normal gene in these mismatched pairs becomes inactive or mutated, the cell has no normal copy of the gene left – and is said to have lost heterozygosity. In the study, investigators used single nucleotide polymorphism (SNP) arrays – technology that reads the elements of the genetic code one by one – to probe HGSOC tissue samples for instances of LOH. The samples tested fell neatly into three groups based on the patterns of LOH within them. One of these groups was distinguished by a high level of LOH and a deleted segment of chromosome 13. When researchers reviewed the medical records of patients in this group, they found the patients were slow to develop resistance to chemotherapy drugs. LOH hampers cancer cells’ ability to survive, rendering the cells particularly dependent on proteins that repair damaged chromosomes. Drugs that target those repair proteins, including a class of agents known as PARP inhibitors, may be especially effective against HGSOC cells with high levels of LOH, the study authors assert. The authors also found that LOH patterns in HGSOC were similar to those in triple-negative breast cancer, a form of breast cancer also characterized by a high level of chromosomal instability. The discovery suggests that agents effective in treating HGSOC might be effective against this type of breast cancer as well, the authors claim.